Immune cells called T cells are central to the body’s defense against cancer and other threats. Immunotherapy is a new pillar of cancer treatment. But like many clinical advances, it emerged out of basic scientific research — in this case, efforts to understand how immune cells work. 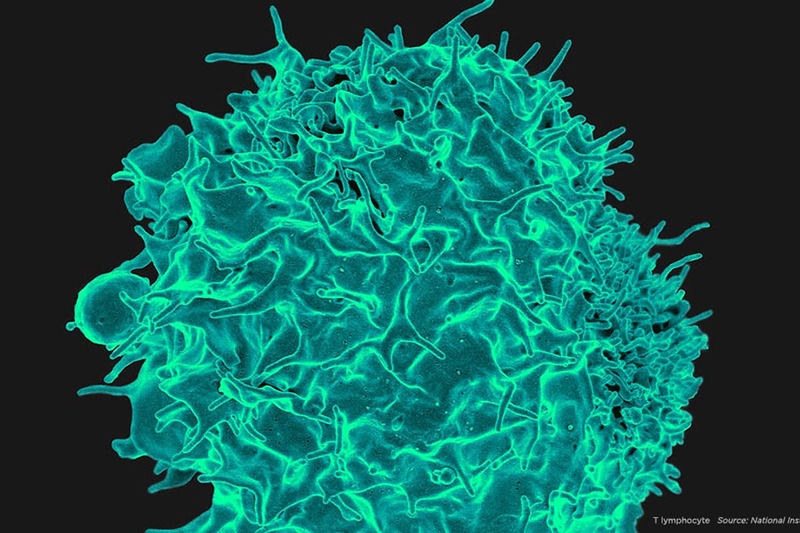 T cells require two signals to become activated and fight disease. Molecules called CD28 and CTLA-4 have opposing actions on T cells. Immunotherapy makes use of these molecules to treat cancer. Immunologists are fond of car analogies. The T cells that protect us from infections and cancer, they say, have an ignition switch. They also have gas pedals and brakes. How immunologists, like good molecular mechanics, deciphered what makes T cells hum is a story that reaches back to the 1980s, when researchers first began tinkering with these powerful cells. 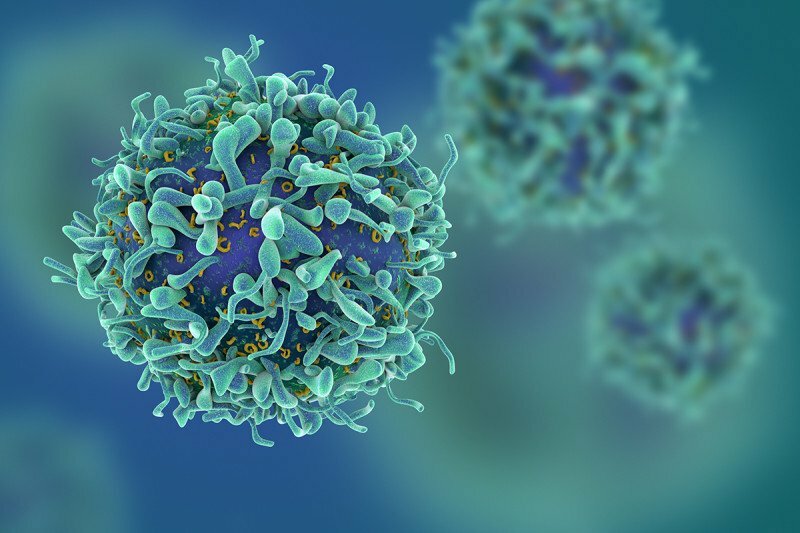 Discoveries they made about what turns T cells “on” would lead, eventually, to insights about what turns them “off,” and ultimately to the development of the first immune checkpoint inhibitor, ipilimumab, now approved for the treatment of metastatic melanoma. But the legacy of this research goes beyond one drug and one cancer. Understanding how T cells work has revitalized interest in immunotherapy as a whole, opening up an entirely new way of thinking about the problem of using our own immune system to fight cancer. Immune cells have a winding and tricky road to navigate. They must be able to recognize and attack a nearly infinite variety of threats, yet spare the body’s normal cells of collateral damage. By the early 1980s, immunologists had learned that what enables this exquisite specificity is a receptor on the surface of T cells that matches — with molecular precision — another molecule, called an antigen, found on the surface of invaders. The T cell receptor is what, in the car analogy, can be thought of as the ignition switch; the antigen serves as the key. But just as a car doesn’t accelerate without a gas pedal, T cells need an additional signal to rev them up. This second signal is known as a co-stimulatory signal. By the late 1980s, the existence of this signal was clear, but its identity remained a mystery. Beginning in 1987, Craig Thompson and colleagues published a series of articles providing evidence that this co-stimulatory signal comes through a receptor called CD28. Dr. Thompson, who was then a professor at the University of Michigan and is now MSK’s President and CEO, showed that stepping on the CD28 gas pedal while the T cell receptor was engaged resulted in a boost of key life-support molecules for the T cell, fueling its growth and proliferation. These studies essentially proved the two-signal hypothesis of T cell activation correct and showed how the second signal worked mechanistically. This fundamental breakthrough still reverberates today. Immunologists take advantage of this knowledge, for example, when they build genetically engineered immune cells to specifically recognize cancer. Called chimeric antigen receptor (CAR) T cells, these engineered immune cells incorporate the CD28 co-stimulatory signal into the genetic payload that is delivered to the therapeutic cell. Yet even after this discovery, questions remained. Why, for example, did cancer-specific T cells with plenty of gas sometimes not attack the cancer? No one could say for sure. Around the same time that CD28 was coming into focus, researchers in France discovered another molecule that resembled CD28 on a genetic level. Many scientists naturally assumed that this molecule, CTLA-4, was a second co-stimulatory molecule — another gas pedal. But accumulating evidence eventually told a different story. In 1994, Dr. Thompson and immunologist Jeffrey Bluestone, while they were both professors at the University of Chicago, published research showing that cells lacking CD28 could not be activated, even when CTLA-4 was present. This argued that CTLA-4 is not a co-stimulatory molecule, or at least could not take the place of CD28. Then, later in 1994, they published evidence suggesting that CTLA-4 functions in a manner directly opposing CD28 — that is, as a brake on T cell activation. This novel idea gained further traction the following year when immunologist James Allison and colleagues from the University of California at Berkeley independently came to the same conclusion. Their T cells, unable to be slowed down or turned off, eventually careened out of control. This was the first time that what has come to be known as an immune checkpoint was identified. A dramatic illustration of the power and importance of this brake came soon thereafter when Dr. Thompson and others showed that mice genetically engineered to lack CTLA-4 died of aggressive autoimmune-like disorders. Their T cells, unable to be slowed down or turned off, eventually careened out of control. This was the first time that what has come to be known as an immune checkpoint was identified. In 1996, Dr. Allison took a further step and made an antibody that blocked this molecule on T cells. He administered the antibody to mice with cancer. To his surprise, he found that just blocking this single molecule was enough to cure cancer in the mice and provide protective immunity against future cancers of the same kind. That CTLA-4-blocking antibody would eventually become ipilimumab (Yervoy®), made by Bristol-Myers Squibb. Dr. Allison came to MSK in 2004 to oversee the clinical development and testing of this drug. He served as Chair of the Immunology Program here from 2004 to 2012, during which time patients at MSK received ipilimumab as part of several pivotal clinical trials. Physician-scientist Jedd Wolchok was the principal investigator for these trials at MSK. The identification of the first immune checkpoint, which could be targeted to treat cancer, was a major intellectual breakthrough. Not only did it reinvigorate the century-old idea that the immune system could be harnessed to fight cancer, it also helped to make sense of why previous attempts at immunotherapy had failed. Before ipilimumab came along, the dominant approach to immunotherapy was using cancer vaccines to try to step on the gas of an immune response. Though this approach had sound logic behind it, the clinical results were disappointing. The discovery of immune checkpoints revealed why that was so: Vaccines could start an immune response, but with the brake engaged, the response could never really get going. Now that several immunotherapies are FDA approved, the challenge is to expand their use and effectiveness. Several MSK researchers are working on this problem and making progress. From understanding regulatory T cells and other suppressive immune cells to manufacturing next-generation CAR T cells, MSK scientists are continuing to drive the field of immunotherapy forward. Editor’s note, October 1, 2018: Former MSK immunologist James P. Allison shared the 2018 Nobel Prize in Physiology or Medicine for work on immune checkpoint blockade, the field-transforming type of cancer treatment discussed in this article. Excellent article to share with our staff. I know research is moving toward applying the brakes at multiple points in the case of Ipi and Nivo trials with NSCLC. Looking forward the that article. Thank you for sharing! Can Immunotherapy help people with CVID or is this therapy currently only used for fighting Cancer? Dear Alfonso, MSK does not treat this condition. We recommend that you discuss this with a specialist who treats this disorder. Thank you for your comment, and best wishes to you. Dear Tova, the drug everolimus is not currently approved for the treatment of lymphoma. There may be trials evaluating its efficacy that are ongoing, but we are not conducting any at MSK. Thank you for your comment. Do you think Immunotherapy would help my wife fight her condition? Dear John, we’re sorry to hear about your wife’s diagnosis. Unfortunately we are not able to provide medical advice on our blog. If you’d like to find out whether immunotherapy may be right for your wife, we recommend you speak with her doctor. If she would like to have a consultation at MSK, you can call 800-525-2225 or go to https://www.mskcc.org/experience/become-patient/appointment for more information on making an appointment. Thank you for your comment, and best wishes to you and your family. Question- is there any point in treating an advanced cancer with, say, a keytruda type of drug but not with ipilimumab at the same time? It seems like you would need both. Dear DK, these drugs may be used separately or together. Thank you for your comment.